Would you like to remove all your call recordings in bulk? Note that call recordings are billed at R0.05 per recorded minute per month saved. So if you were to save 1,000 minutes of recordings for 2 months the total price for these recordings would be R100.00 ( 1,000 minutes x R0.05 x 2 months ). Billing takes place once a month. In this example R50.00 per month. 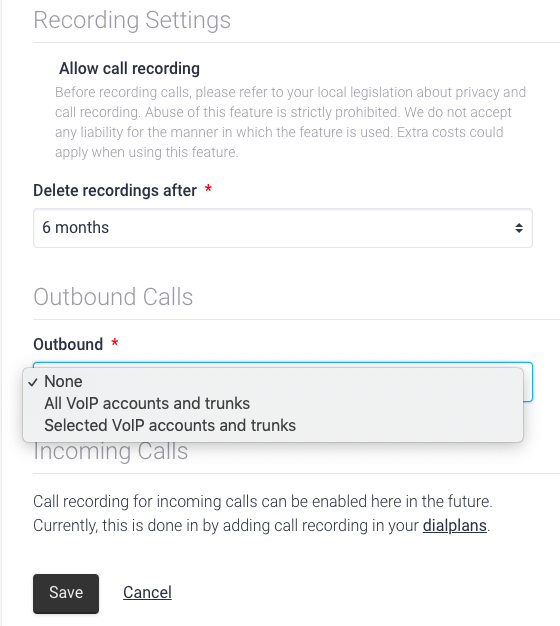 Let's say you are currently storing recorded calls on Freedom for a period of 3 years and you decide you no longer wish to save your recordings this long, but only for 1 month. Select the the age of the recordings you want to remove under 'Delete recordings after'. Read the pop-up notification carefully, and if you agree, click Yes, that's what I want.